Oh no, the village bridge is broken. But that’s okay, I’ll ask for help from the spider in this tree. Come down mister spider, and help me fix the bridge. “Did you break it?” he asks. Yes, I say. I walked across the bridge – really just a piece of string – and it snapped. I consider his words carefully. And then I boot him in the head. As he soars over the river, his spidery silk follows, forming a new bridge of thread between the river banks. He’s upset. 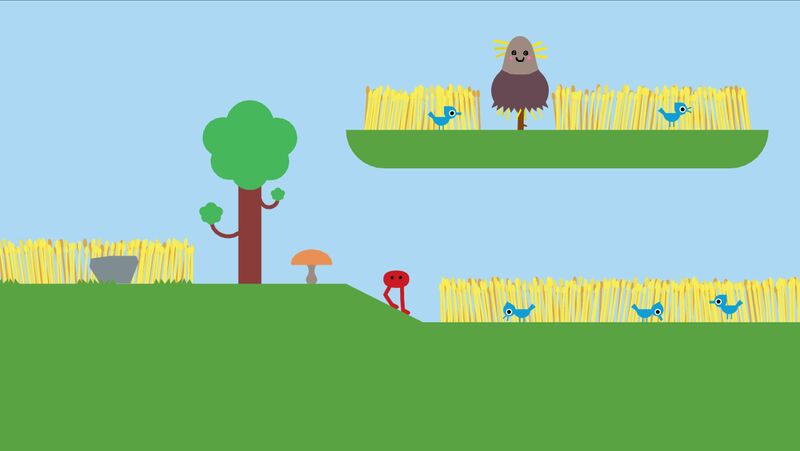 Pikuniku is made of scenes like this one. Childish arguments and misunderstandings between blobby, colourful residents of a world that could be described as Mr Men meets LocoRoco. It’s a physics-based platformer, but it feels more like a children’s storybook that didn’t get approved for the school library. At the start of the adventure, your character wakes up in a cave, roused by a ghost. You’re just a simple red shape with eyes and legs. Nobody in this vector art world has arms (at least none of them do in the Gamescom demo I’m playing). And why would you need them? There are very few problems that can’t be solved with a good kick. Aside from pottering about on your wobble-legs, you can also pull said legs into your body and simply roll from place to place. Later you can grab zip lines and swing from hooks. That’s more or less your entire range of abilities. Simple enough for both kids and games journalists to understand. But it’s not the movement that endears me to my twenty-five minutes of Pikuniku-ing. It’s the chat. 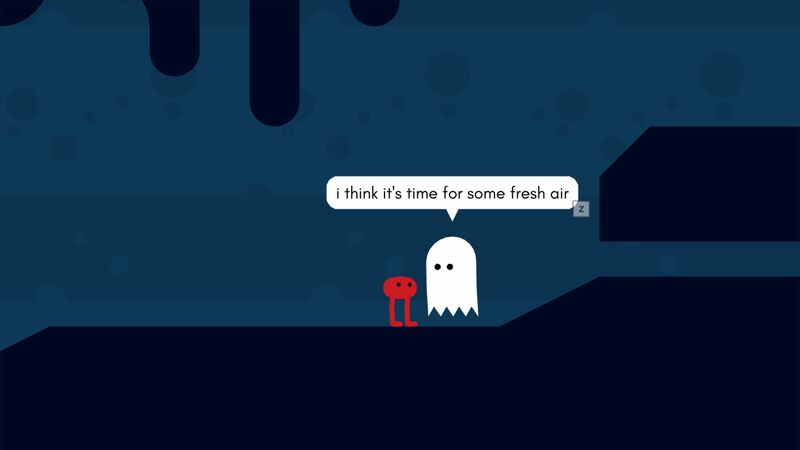 When you talk to the ghost who woke you up, he invokes that favourite line of game developers. It’s not safe to go alone. Much of what I saw had the same playful tone. The terse, bulletpoint dialogue of an ancient JRPG filtered through a trippy nursery rhyme. It’s perfunctory, colourful, and often summons a giggle. I ask some bluebirds in a nearby field what they are doing. “Chilling,” they say. Later, some villagers capture me and start yelling: “The beast is awake!” I keep trying to escape by jumping around the inside of the cage, but it’s no use. I’ll have to do what they ask, and fix the bridge I’ve broken. All these silly encounters remind me of the best cartoons designed for kids, the ones that are inevitably co-opted by greedy adults, but ultimately enjoyed by both. I’d be happy to continue this walkabout, chatting to the blobescent characters of the village, but there’s a traditional puzzle platformer running through all the jollity (not to mention a story involving a creepy businessblob and a “deep state conspiracy”) so I’ve got to crack on. It mostly takes the form of simple puzzles. I’m drafted in to help out the local painter, for example. He’s lost his pencil in his own basement. In the end, this puzzle room is a stress-free matter of pressing switches and stacking boxes to reach the pencil, lying on a higher platform. The aim is to keep things straightforward, I’m told by game designer Arnaud De Bock. We play a bit of the co-op too, and it’s likewise a jaunt through simple levels (sadly lacking the characters of the singleplayer world). The puzzles are basic. One person stands on a door-opening button, while the other pushes a giant ball through. There’s a brief car race in the form of childish split-screen speed-freakery. And at one point we find ourselves both rummaging around in ball pits, fighting with the purposefully clumsy physics to kick the balls out and onto some switches. We also kicked each other in the face very often. 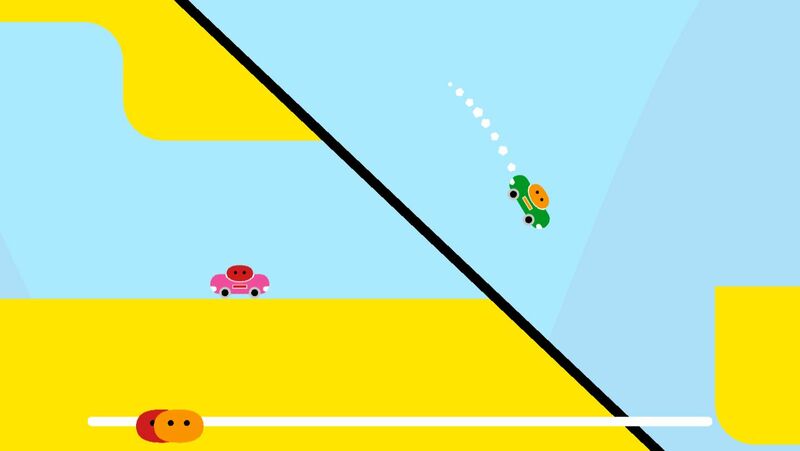 Easy-going co-op that at moments can break out into childish, petty squabbling. It’s oddly soothing. It’s sure to be labelled cutesy, twee and “charming” but if the small chats I had with birds and blobs are anything to go by, I hope to find more of that fun-loving absurdity underneath it all. One of my favourite moments involved the five blobby villagers standing on top of one another, like a multicoloured totem pole. They were accusing me of being a horrible beast of legend. As they spoke, the blobperson on the very bottom of the tower started rotating with every accusation. I don’t mean he was turning to face away from my view. I mean his whole sprite was rotating on its axis, his legs leaving the ground and pointing left, now up, now right. There was nothing supporting the rest of the villagers, and yet it didn’t fall, they just carried on accusing me of being a monster. I’m looking forward to seeing more of that daftness. How do you give a thumbs-up in a world with zero arms? 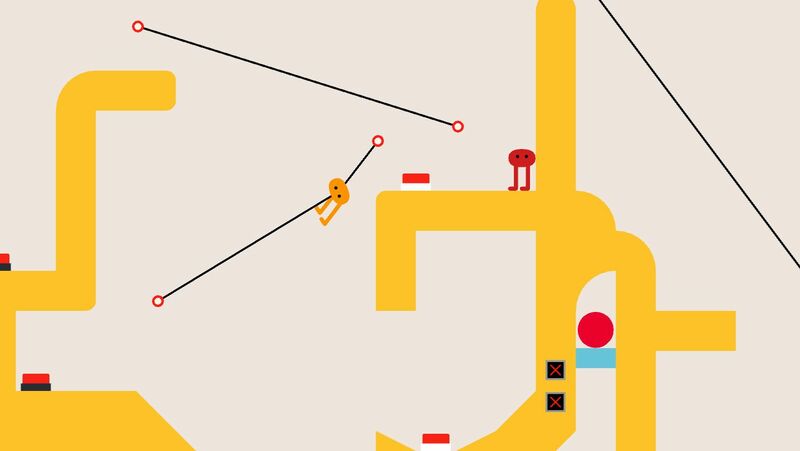 Tagged with Devolver Digital, feature, Gamescom 2018, preview, Sectordub, Pikuniku.